Have you suddenly encountered with the problem that when you plug in your USB drive, the Removable media shows up but when you try to open it, it returns with the message “Please insert a disk in to drive H:”. If yes then you have been on right tutorial page. By applying this simple method you’ll have 80 % chance to get back your USB drive hardware. This works only in the above error condition. 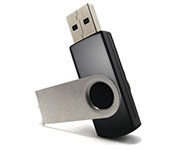 If the windows doesn’t detect your USB drive, then there is probably flaw in the USB media. Please keep in mind that, you’ll have to lose your data when following this tutorial. Go to Start>My Computer, right click on My Computer icon and click on Manage menu. Computer Management window will pop up. Click on Disk management under Storage tree menu. Now at the right side of the window right click on your removable media. (unlike the image below, it will show unknown information), right Click on your removable media and chooseChange Drive Letter and Paths. Now in new window choose any drive later that is not taken by any media (M:, N: , :K: etc). Click on ok button and close the management window. Try opening your pendirve. There may be the chance to have your pendrive recovered if this method worked. If the problem still prevails then follow the above tutorial but instead of choosing Change drive letter and paths, choose Fomrat and give a quick format to it. Now you’ll have finally lost your data but the pendrive is safe in your hands. Hope this tutorial was working. If it didn’t please do comment me. I’ll find other solutions as well.